In case you missed them, check out our 3 Favorite Low Carb Strawberry Dessert Recipes! After that post, we got a lot of feedback asking for a strawberry cheesecake recipe! 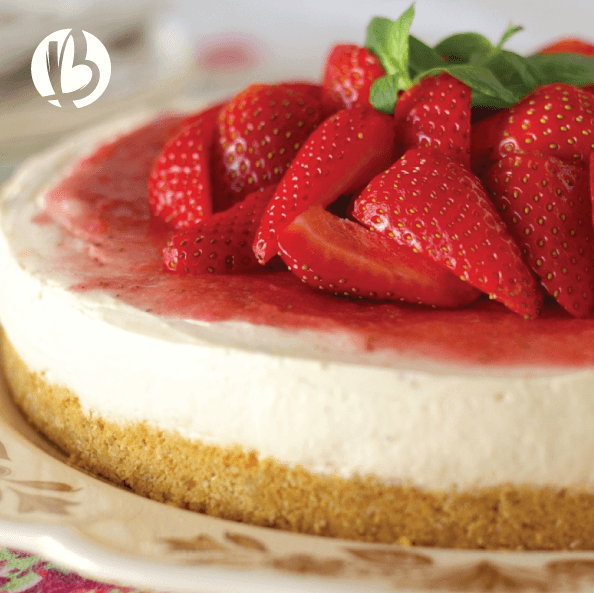 So, here you go: BeyondFit‘s Low Carb Strawberry Cheesecake! In a large bowl, mix together all crust ingredients and press into the bottom of a spring-form pan. Set aside. Scrap the inside of the vanilla beans out with a sharp knife. Place scrapings on a small glass plate and set aside. Using an electric mixer, mix the cream cheese, optional protein, stevia and strawberry jam until well blended. Bake for 1 hour to 1 hour and 15 minutes until the center is set and the top is lightly browned. Get the PEScience gourmet vanilla or limited edition Strawberry Cheesecake Protein here! Ready for some more healthy dessert ideas? We’re sharing our best quick & easy fat loss friendly (and still incredibly delicious) recipes for sweets & treats with YOU! Don’t miss this incredible offer! Get your dessert cookbook today! OUR PROTEIN POWDER COOKING AND NUTRITION RULES: learn our non-negotiable and essential principles when it comes to baking with protein powder. Check out more recipes from our Summer Sizzle Series HERE!